From the very first day at Middlesex, to my very last day, graduation – I always felt a sense of belonging. I started my studies not knowing what to expect from Middlesex, but soon I learned that there was so much going on and heaps of events to get involved in. This is when I decided to become a Student Ambassador. Why not work for the university, and earn while you learn? By third year I had bagged tons of new skills and felt I was ready for the big wide world. The buzz at events made me feel like I was a bigger part of Middlesex, from open days, to offer holder evenings, postgrad events, clearing and graduation. Working as part of a wider team made me feel welcome. When you constantly see the same people around campus and work with them on numerous events, you become each other’s extended family. 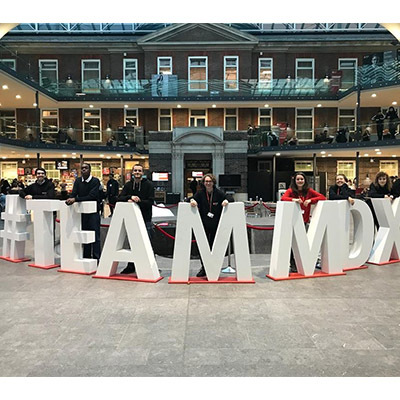 #TeamMDX means no matter what happens, you will always have a home here at Middlesex. The most diverse institution I have ever come across, with students from every corner of the world. Middlesex brings cultures together and creates bonds stronger than ever. Middlesex gave me friends for life, with people who I would otherwise not have interacted with outside of this University. Middlesex means family. Belonging. Togetherness. Inclusion. Middlesex is home. 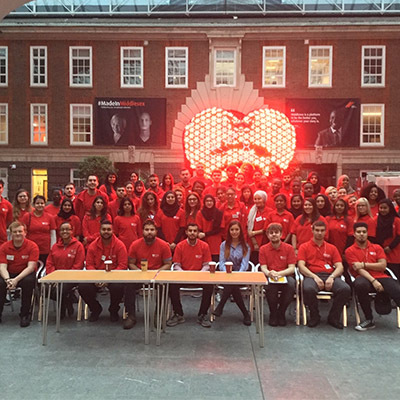 To be a part of #TeamMDX means to be a part of a big, diverse family. Middlesex University has students from all over the world, which is something I find really impressive. Since I started studying and working here, I’ve met so many different people from different backgrounds, who live on the other side of the planet. This is a unique opportunity that enriches my life with a new perspective of the world and with new friends all over the globe. For me, it also means having the freedom, support and facilities to do my projects, so I can be better prepared for the future. It also enables me to be more ready for what is to come. We as students sometimes devalue and take for granted what we have... while we are here I think we should get the most of all the opportunities, events and parties that the university organises for us and for our future. For many of us, university is a very small part of our lives – just a few years. However, it is one of the biggest and most important chapters of our lives that we will always remember, so why not make the most of it?! Got your own story of collaboration, support or just an example of unity within the Middlesex family? Why not share it on social using the hashtag #TeamMDX.